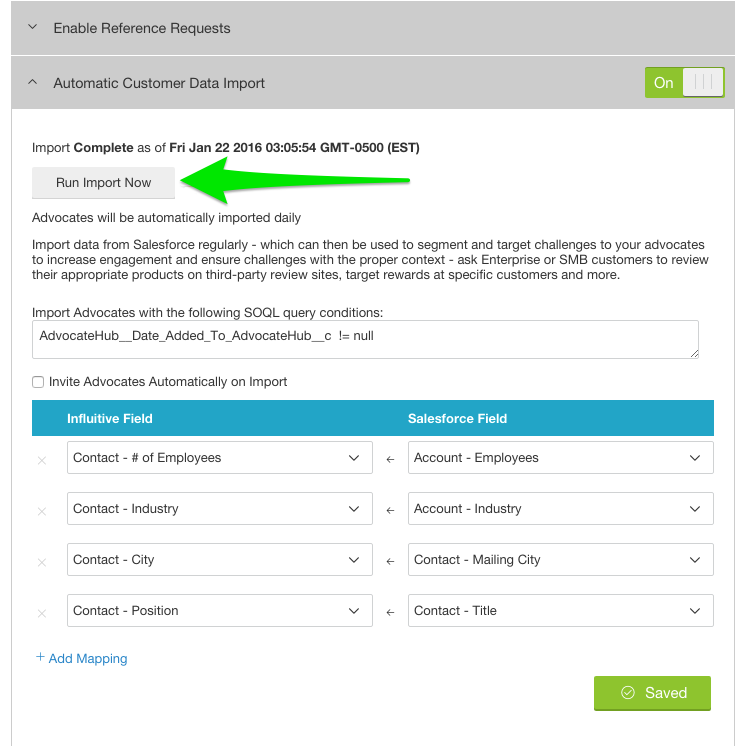 The Automatic Customer Data Import is our fancy name for how you can sync information from Salesforce into the AdvocateHub. This information can then be used for segmentation inside of your AdvocateHub. You can pull this Salesforce information for any advocates who exist in your Salesforce as contacts, and it will stay updated with a nightly sync. This article will walk through setting this feature up. To be able to do this, you'll have to have first installed our AppExchange Package in Salesforce. If you haven't done this yet, this Installation Guide will be a huge help! To begin, you must create a match category which will represent the Salesforce field you want to pull information from. These match categories will be displayed as a "Match Criteria" field in an advocates profile (visible to administrators only). You'll then be able to target things in the hub based on this information. Go to Settings > System > Match Categories. Go to Integrations > Manage (Salesforce) > Settings tab > Automatic Customer Data Import. Click on + Add Mapping. In the left drop-down menu, choose one of the new match categories you made. In the right drop-down menu, choose the appropriate Salesforce field that will sync to this AdvocateHub match category. Create any additional mappings for match categories you've created and would like to segment by, and then Save. This default query looks for a date in the "Date Added to AdvocateHub" field on your Salesforce contacts. When you invite someone to the hub, Influitive will automatically populate this box with a date. Then, based on this query, Salesforce will sync that contact's info into their Advocate account counterpart. 2. (Optional) If you want to automatically invite advocates through Salesforce, tick the optional checkbox. This box is used to invite new advocates into the hub based on the query above it. 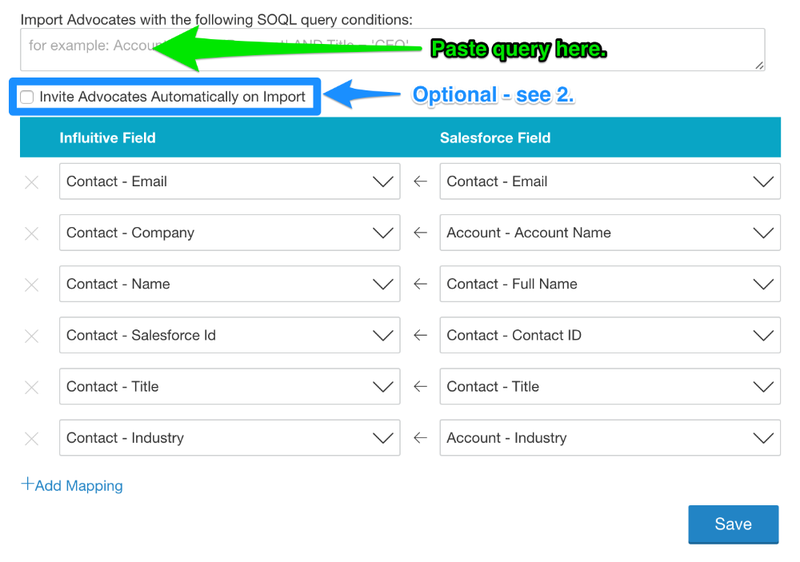 If you keep the query as is and tick this box, you can manually add a date to Salesforce contacts as a way to automatically invite them to the hub. You can create a custom field in Salesforce called "Invited to AdvocateHub" and make it a checkbox field. You enter a query that looks something like this into step 1: "Contact.Invited_to_AdvocateHub__c = True" (this would mean the import works only for SFDC contacts who have previously been invited to the Hub). You update Salesforce contacts you want to invite by adding a check-mark to this new Salesforce field. To confirm everything is set up correctly, you can manually trigger a sync to confirm data is flowing from Salesforce correctly. Click Run Import Now (this will start a sync between the AdvocateHub and Salesforce to update all advocates who are matched up with Salesforce contacts). When the sync is completed, go to your Advocates page, find an advocate who exists in Salesforce. Click on the pencil icon beside their name and click Edit. Click on the Match Categories tab. You should now see the fields you just added filled in with data. If all the fields are now populated, it was a success! Continuing from our example where we mapped Industry, we can see the sync worked correctly! Note: Please note that for Name, Email, Title and Company fields, data from Salesforce will be pulled on the first import only and subsequent updates, so that changes to these fields made by your members will not be overwritten.